Italy’s capital is one of the rare cities in the world with so many historical sites and art landmarks, dating back 2,500 years ago. Rome will capture your attention with its vibrant lifestyle and the world-class Roman cuisine, as well. Exploring Rome is an endless journey with new surprises on every corner and you will need to visit it a couple of times in your lifetime. Planning a trip to Rome includes choosing transport type and booking an accommodation. Whether you’re arriving at one of the Rome airports, Fiumicino or Ciampino, or at the Termini station, you will need to organize your Rome airport transfer. There are several options available and in this guide, we’ve summarized the essential info you need to know about each of them. Public transport is the cheapest option to get from Fiumicino or Ciampino airport to your destination if you’re travelling alone and you don’t carry too much luggage. Fiumicino airport has both railway and bus connection to the city centre. The Leonardo Express train is the preferred public transport option which will take you directly to Rome Termini Station and departs every 30 minutes. It is more expensive than taking a bus, but it’s undoubtedly the fastest. There is also a local train labeled FR1 service, which circles around the city with multiple stops. You need to be aware that the Termini station and the Rome city centre are not on its route, so you will need to take another train. If you choose Rome bus transfer, the journey will take around 45 minutes to get to Termini Station, but usually, if the traffic is busy it might take longer. You can check the timetable and buy tickets online or directly at the bus stop. Ciampino airport has only bus connection as a public transport option available. There is a direct link to the Termini Station which is the main public transport hub in Rome and also a local bus which connects this airport with the southern line of the metro system. Driving in the city is not recommended, as the traffic is insane at times, it’s hard to find parking space and parking garages are very expensive. Use public transport or Rome taxis for getting around the city instead. Car rental is a good option if you plan daily trips and excursions outside Rome. It gives you the freedom to organize your own time and have a nice time without having to worry about time schedules. All major car rental companies have offices in the Arrivals hall at both Fiumicino and Ciampino airport. However, it is more convenient to book it online and finish all formalities prior your arrival. Sometimes it might get busy, especially at Fiumicino airport, so you might end up waiting in a queue up to 30 minutes. Taking an airport taxi is always a good idea when you have luggage with you and haven’t arranged your airport transfer in advance. The licensed Rome taxis are located at the taxi ranks at the Fiumicino and Ciampino airport. These taxi cars are white in color and have a sign „Taxi“ on the top, as well as, an identification number displayed. 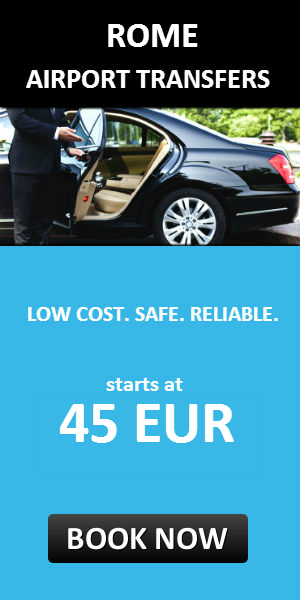 If your destination is in the Rome city centre, then a fixed price of 48 EUR will apply including your luggage. However, if you’re headed to the suburbs, then you will be charged by the meter and additional fee for your luggage. It is very important to take a licensed taxi by the city of Rome as there are many impostors approaching the tourists offering taxi services and overcharging them. If you’re approached by a taxi driver in the Arrivals hall or anywhere outside the taxi ranks, don’t take the taxi, you will be ripped off. 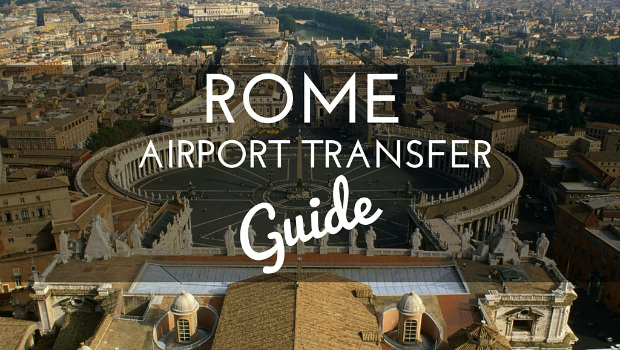 Another cost-effective option for solo travellers is the Rome shared airport transfer. There are several shuttle service providers which organize Rome airport transfer from Fiumicino and Ciampino airport. First, you need to check if your destination point is on their map or if there is any stop nearby. Otherwise, you might need to take a taxi or public transport to your accommodation. As it is a shared transfer, the shuttle makes multiple stops and this will increase the journey time, especially if your drop off point is at the last stops. The service needs to be booked in advance and there is a fixed cost. You can carry maximum one large and one carry-on luggage, so if your luggage exceeds the allowed amount, you will need to check with the provider if it’s possible. Private Rome airport transfer is the most convenient and comfortable option, as this is a door-to-door service arranged prior your trip. The taxi driver will be waiting for you at the airport, holding a sign with your name and take you directly to your destination. Flight monitoring service is included in the price, so in case there are any flight delays, your pickup time will be adjusted. The taxi fare for the Rome airport transfers is a fixed amount and with City-Airport-Taxis.com the price from Fiumicino airport to Rome city centre starts at 45 EUR is lower than the one provided by the official Rome airport taxis. For larger groups, van and bus transfers can be organized and the price is per vehicle, so the cost is split among the travellers and is significantly lower compared to the other Rome airport transfer options. Before you make a decision which Rome airport transfer option to choose, compare the different rates and timetables. Make sure to choose the one that will fit your budget and take less of your time in Rome. By saving time on Rome airport transfer, you will have more time to explore and enjoy the beauties of this city. See Rome in a Day? Challenge Accepted!